Spring Creek Real Estate & Origin at Spring Creek’s +65 Seniors’ Residence are on a mission to help the Canmore & Area Health Care Foundation raise funds for their Golden Eagle View enhancement project, “FEELS LIKE HOME” at the Canmore Hospital. Golden Eagle View, Bow Valley’s first long-term care facility at the Canmore Hospital is looking to renovate. The project will include improvements to the dining room/Beauty Salon, the resident rooms, the common living spaces, the entrance and nurses desk. The crowing feature will be the addition of a large solarium offering residents the chance to bask in the glory of the mountains we all love. The goal is to enrich the quality of life for the residents by creating a more home-like environment complete with themed hallways and personalized doorways, using research-based colour combinations that elderly and dementia-care populations are attracted to and thrive in. 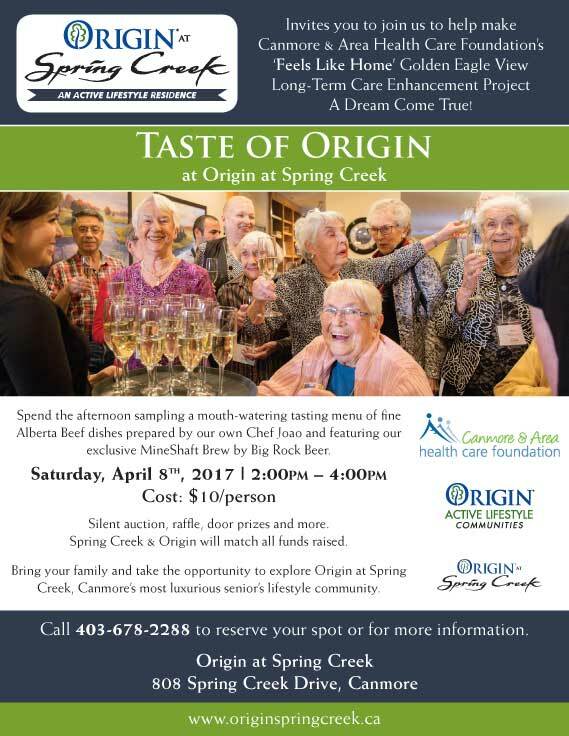 Spring Creek and Origin Lifestyle Communities will be matching all funds raised towards this exciting project. We hope to see you there.